I drove to a Parrot Rescue 75 miles away today. I am going to be volunteering there one or two days a week. The birds range in size from a budgie to several Greenwing Macaws. They range in age from fairly young, to an old wild-caught Moluccan Cockatoo of unknown age. I saw a breed I had never seen before, a Mealy Amazon. I never knew that they were so big, and chunky. Last edited by Navre on Sun Feb 18, 2018 10:02 am, edited 2 times in total. I have never seen a Mealy Amazon in person either, but I was aware that is one of the largest species of Amazons. I also know that it is considered to one of the most docile of all of the Amazons. He had foot problems when he came in. They are a very heavy bird and they don't move around much. He had had sand perches and they really messed up his feet. He has better perches now and he's doing better. He makes the funniest chortling sounds. I will try to get a picture of him. Last edited by Navre on Sat Mar 05, 2016 8:25 am, edited 1 time in total. Oh, poor guy! Those sandy perches are terrible on their feet, it's inexcusable that they are even sold, if you ask me! What a great thing you are doing! Rescues are always in need of volunteers but, I might as well warn you, working in a rescue will break your heart. I ran a bird rescue and did full time dog and cat rescue with a group and I lost 20 lbs in the process -couldn't even sleep at night sometimes. My entire family was so worried about me that my husband decided we would move back to NJ. With 40 birds, I think your current rescue is larger than the one at which I'm volunteering! I think the capacity is 50ish, but I think there are around 30 there now. A parrot rescue can be a Pajarita says "heart breaking". You just have to keep in mind that these are the lucky ones: no more abuse, no more neglect, no more being put in a closet or a basement, no more being hungry with no hope in sight. They may be pitiful but now they have hope. Any thing you do for them is one more thing they can enjoy and they all need more joy. When I volunteer at the wild life rehab at NC Zoo there was a goose that would not come out of the cage for me to clean it. I had to go hin (goose poop is bad). He bit me a few times for being in his space (no teeth but serrated beak left bruises. This is the same goose I saw playing in his water bucket. I put a little plastic cup in his bucket and he started bailing water and playing. If I had not been there he would have just stayed bored. Every little thing you do enriches their lives. 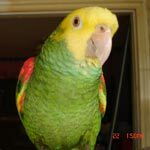 Navre wrote: With 40 birds, I think your current rescue is larger than the one at which I'm volunteering! Actually, I currently have 30 parrots (I too, 2 grays, 6 zons, 6 tiels, 7 budgies, 1 quaker, 1 jardine, 1 jenday, 1 redbelly, 2 senegals, 1 GCC, 1 peachfront), the rest are canaries (14), finches (7), cardinals (2) and button quails (2) but I am looking for a male redbelly and a male jardine so they can have companions of their own species because although the redbelly gets along fine with the male Senegal and the jardine hangs out with the CAG, they are not really bonded and would greatly benefit from having somebirdy of their own. There is a female peach front at the rescue. She seems very shy and quiet. I think there are 4 conures there. A peach front, a Jenday, and 2 Blue Crowns. My peachfront is a sad case... I don't know his age because he is a wild-caught with an open band that has( nothing on it so he has to be quite old. He has half a wing and the missing half was not amputated by a vet because the bone is cut in half, he has a piece of his lower beak missing and, when he first came, he would walk in circles and fall to one side all the time. I got him from a lady who having one GCC, went to a breeder to get another one and was offered this bird for very cheap. The breeder said he had gotten him as part of a proven pair from another breeder but then realized he had been sold two males (no honor among thieves, apparently ) and that, because of this, he couldn't use him. But I think this was a lie because the bird was in terrible, terrible shape and once the lady brought him home and realized that he wasn't just clipped (as the breeder had claimed) but that he was missing half a wing, that he would fall off the perches, do nothing but trip and fall while incessantly walking in a small circle and that he was TERRIFIED of people, she put an ad on Craigslist about him asking for only $50 (which immediately raised a red flag with me as, at that price, Lord only knows who he would have ended up with!). It took almost a year to get his neurological problem taken care of (I think it must have been a dietary deficiency) and my vet recommended to leave his wing as it is so I just clip the other one real short so it's easier for him to keep his balance and have slowly gotten him used to me and to know his name: Pablo. I guess I could work with him teaching him to step up and such but he is old and has had a real bad life so I figured let him live the rest of his life on his own terms, poor thing. He doesn't live in a cage, enjoys his food very much, has a girlfriend (they sleep leaning against each other and it's the cutest thing!) and nobody bothers him... He appears to be happy. Bless you for reading craigslist and knowing the signs of an emergency rescue. Phoenix wasn't even on craiglist but Flutter was listed as cheap. By phone the owner told me he had another one who was too ugly to sell. I talked the man into $100 for both. He brought them to my van in a cardboard box. I took the box and through a $100 at him. Whatever was in that box needed me.